Hope you all had a great Deepavali Celebration at home with family and friends! Now its time for our HTS Balvihar Deepavali. This is for our children and we need all your help to make it a sparkling success! Requesting all families to dress in Indian attire to bring Ronak Dhoom Dhamaka to our festivities! 10 am - Arts or Games. 11 am - Change of Arts or Games. 11:45 am - Lakshmi Pooja. 12 :15 pm - Food distribution. All the parents who chose central cuisine are contributing towards food, volunteering and clean up, Thank you! Please arrive at 9 am and find the team you wish to assist. We need all parents of Religion 1 and 2 to assist their kids in arts. Our Arts team has come up with a beautiful art work for Deepavali! Lunch boxes are free for Balvihar students, all of us will purchase a box at $2.50. Arts, games, fireworks and Lakshmi Pooja are only for HTS Balvihar kids. Balvihar Hoodies : We wear Navy Blue Balvihar with HTS logo hoodies for special events. Group pictures, field trips or when we want to show our culture pride! A lot of parents purchase these hoodies to show solidarity! At the end of the Balvihar year, we take pictures with the class in these hoodies. Our Asst. Director, Purviji will be placing the order for Hoodies soon, so we request all parents who want these hoodies for their kids or themselves to meet Purviji on this sunday to confirm size, order. Please like our HTS Balvihar FB page and watch out for future posts and information! Thank you. 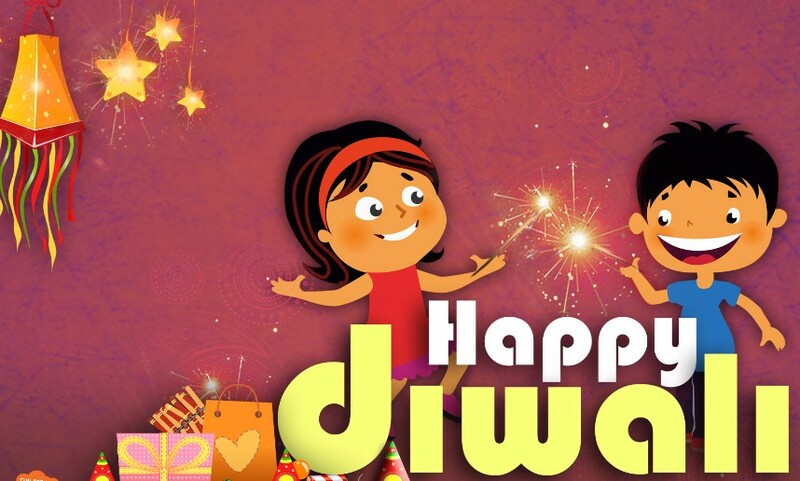 Happy Diwali HTS Balvihar Family! See you all on Oct 29th for HTS Balvihar Deepavali Celebrations. Thank you. Namaste! Hope you all had a great HTS Balvihar Celebrations for Dussera with us on Oct 1st. We would like to thank Pranav Balabhadra, Ansh Malik and Nikhil Chitluru for helping us with food committee responsibilities. Thank you to all of our wonderful Balvihar parents who volunteered in Bhagwan Sketching session, Boxing food, serving food to kids and Ravan Dahan! Raam Parivar truly steals the limelight with their innocent faces and character portrayal! Thank you to all who bring in joy and laughter to every moment at Balvihar! We thank Sejal and Hiren Patel for bringing our fireworks that made the Ravan Dahan explosive and awesome! The Arts committee has managed to keep us in awe of how dramatic the Ravan gets year after year! !Aloo tikki, Samosa and Brownies of course was a hit with the kids. We thank the North Indian Cuisine who took the responsibility for Dussera. Oct 15 is a regular class day - However, We have a special treat for our Teachers. Last year we surprised them with a "meeting" and celebrated our Guru parampara by honoring them. We will invite them for Teacher appreciation Breakfast from 9 am - 9:45 am. Kindly be in the temple hall right on time, 9:45 am, be disciplined and organized. Stand up when the teachers come and cheer for them. Once all of our teachers are inside the temple hall, we will sing "Guru Bhrama Guru Vishnu mantra.." in their honor 3 times. Pranav, Yajusha, Siddhi, Uma, Sribalaji, Abirami will guide you in the process. We also encourage you to make cards, letters for your teachers and give it to them this sunday. Show them how much you care. Every teacher spends on average 40 hours or more of their weekends for all of our kids each Balvihar Year. They are simply marvellous! After our morning Aarti at 10 am, We will resume our Oct 15th classes at 10:10. Please make sure the children have revised their study material, homework. Balvihar Cafe Menu : Idli, Dosa, Upma. ------Attention : For HTS Balvihar information or HTS Facebook info please only rely on www.Balviharallentown.org or the HTS FB page with om logo in the icon. Other websites and facebook pages are yet under construction and prone to trials and errors and are not managed by the HTS Balvihar Team. We do not want HTS Balvihar Families to be confused or misdirected. Thank you.